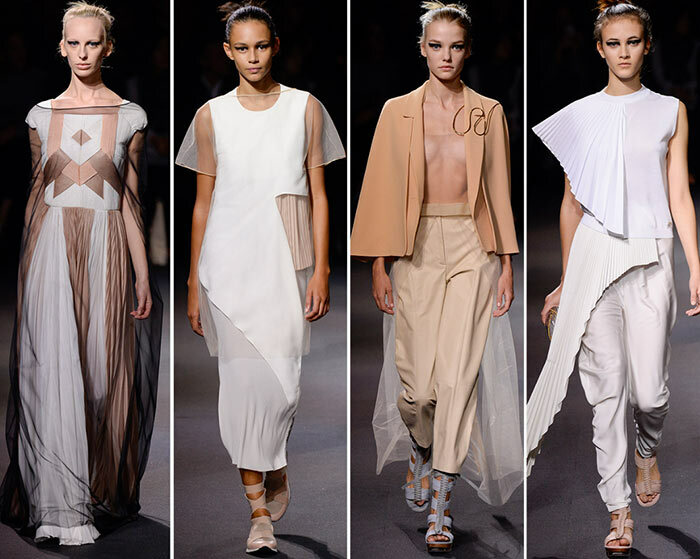 Vionnet‘s spring/summer 2016 ready-to-wear collection made its debut at Paris Fashion Week, under creative director Goga Ashkenazi, who also enlisted the help of Hussein Chalayan in hopes of steering the line in the right direction. To an extent, it did. Vionnet’s house aesthetics were still present, but were presented in a subtler, more easygoing way. This is no doubt a positive result of the collaboration. This season, Vionnet designed for a strong woman. There were clear “goddess’ silhouettes, while others still were more sleek and seductive. The most striking garments in the collection, however, were the ones that combined both ideas. The draped gowns hold the ethereal “goddess’ silhouette that’s a standard sight each season, so while the dresses were beautiful, and some were even unique in small ways, there was nothing particularly impactful. On the other hand, however, these standard goddess-inspired elements were paired with a strong vision of a woman, often in black or dark green. The first look on the runway that employed this combination was a floor-length black dress, with a deep V neck and mesh that hung around the model onto the ground. You can’t deny the beautiful strength of this dress, and the goddess design was not compromised either. The mesh was a little too gaudy for the look, but the design behind it was well-meaning. Without the mesh, the dress may appear too simple, but taking a step back and editing it down would have worked wonders for the garment. The mesh was a recurring theme in the Vionnet spring 2016 collection, and in most garments, a little pairing down of the mesh would have taken some of the questionability from the line. One unique, strangely appealing use of the mesh, however, was on a simple, black wrap bodysuit. The mesh hangs back behind the model, and comes around at her ankles, caging in her legs with a woven-lace fabric. There’s still a semblance of doubt, as it’s hard to determine whether or not this garment is successful. It’s something so unexpected, and the technique behind the structure is great. There just isn’t much of a market for a mesh cape that circles the ankles ” it’s unconventional but makes for an interesting runway piece. The final garment has the impact the rest of the collection fell behind on. It’s interesting and aesthetically appealing while showing the house strengths. There are really two great dresses here that were pushed together. On one side, there is a strong, sleek silhouette in white that embodies what half of the collection conveyed, while the other side sported feminine pink pleats, personifying the other half. While the white sleeve (or lack thereof) is a questionable detail, this dress made the loudest statement on Vionnet’s runway.